It finally happened... we got a big-ticket change to the SERP. If you have been following the 'SERP News' series (as I'm sure you have) you'll know that since the start of 2019 I've been banging the drum that things have been eerily quiet in that the SERP has not had a major shakeup. Well, the SERP is quiet no more as Google has confirmed its first algorithm update of 2019! Between March 12th and March 15th Google rolled-out a fairly significant algorithm update. In fact, the dramatic increase in rank fluctuations was confirmed by the search engine to be a "broad core algorithm update." Thus, the March 2019 Core Update (a name given by Google's own Danny Sullivan) is the first confirmed algorithm update of 2019. Google began confirming broad core algorithm updates in March 2018 (exactly a year before confirming its latest core update... coincidence?) with the most famous instance being August 2018's Medic Update. Indeed the Medic Update, one of the largest updates to hit the SERP, was until this point the last algorithm change to be confirmed by Google. This conjured up much speculation that the March 2019 Core Update was somehow related to the Medic Update. After analyzing the data, we've determined that this was not the case. For starters, the March 2019 Core Update did not more heavily impact YMYL (Your Money Your Life) sites (as was seen with the Medic Update). The Health niche, for example, did not display more volatility than any of the other niches I analyzed. 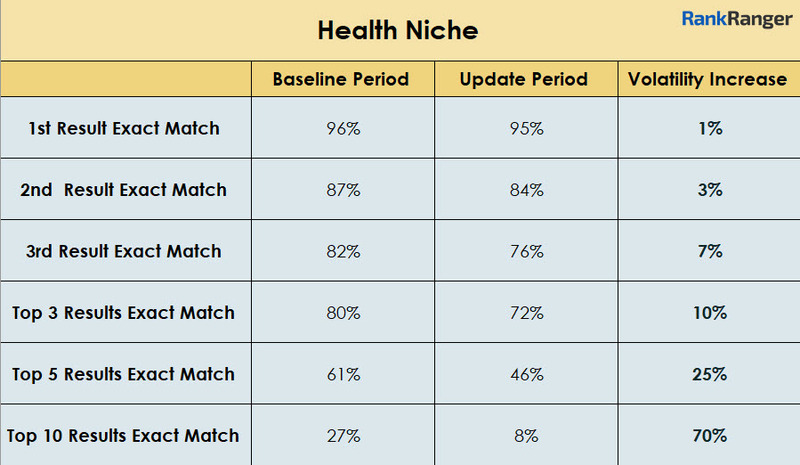 In fact, health sites displayed a bit less rank volatility overall during the update when compared to some of the other niches. 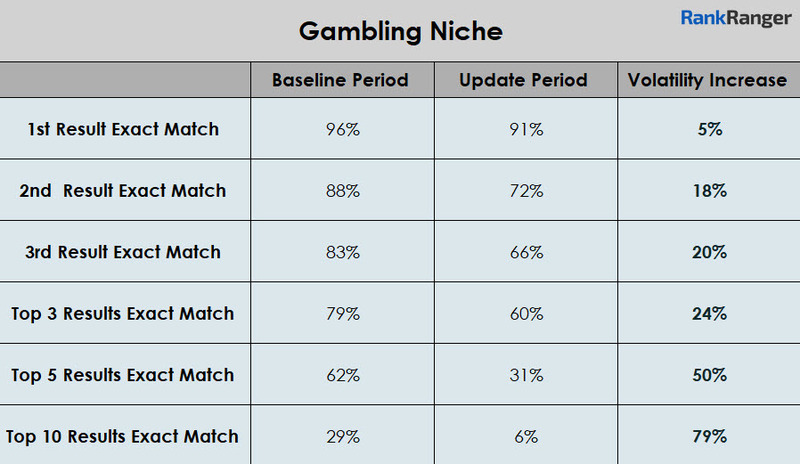 If you compare the data from the Health niche to that of the Gambling niche (see below) this will become clearly evident. At the site level, there was some early speculation that the March 2019 Core Update reflected a reversal of the Medic Update. Indeed, some sites heavily impacted by the Medic Update, such as draxe.com, saw dramatic increases in visibility as a result of the March update. However, despite the surge, many of these sites were not returned to pre-Medic visibility levels. At the same time, the sites most heavily impacted (both positively and negatively) by the March 2019 Core Update were far more diverse than just those sites that were affected back in August of 2018. Ever since Google said that significant changes are coming to image search everyone's been talking about the topic, speculating if any given change is what the search engine was referring to. March was in many ways the most "dramatic" month of image changes on the SERP and image search per se in quite some time. There were multiple data shifts and more than a few changes/announcements made throughout the month. Way back in July 2018 (OK, that's technically not so long ago, but in terms of the news cycle it might as well be a thousand years ago), our Mobile SERP Feature Tracker caught Image Thumbnails appearing on 45% of mobile page one SERPs. After doing a bit of digging I saw that the jump in mobile Image Thumbnails was due in large part to local keywords. Fast-forward to March 7th, 2019 and mobile Image Thumbnails have hit a record high. The SERP feature now appears consistently on roughly 65% of page one mobile SERPs. Instead of being driven by local search terms, this mobile Image Thumbnail shift was pushed by more and more product-related keywords pulling up the thumbnails. Aside from an increase in the percentage of mobile page one SERPs that contain at least one Image Thumbnail, the overall average number of thumbnails per page spiked as well. Prior to the early March increase, the average mobile page one SERP contained four Image Thumbnails... that number now stands at five, which is a pretty substantial increase (it takes a lot to move the needle to that extent). While March saw more mobile Image Thumbnails, it also saw a considerably fewer number of SERPs with an Image Box. In this instance, the decrease took place irrespective of device. Both the desktop and mobile SERPs saw two downshifts in the display levels of Image Boxes with one occurring at the onset of March and the other on March 21st. When all was said and done Image Boxes on desktop saw a 10% loss while Image Boxes on mobile underwent a 16% decrease (US). Moving beyond image related SERP features, image search itself was quite newsworthy in March. Most notably, Google announced that two new ad formats will be hitting the Image SERP. The first, "shoppable ads on Google Images," creates a seamless image SERP ad experience as it appears as an image within the image results (under a 'sponsored' label). More than being seamless, the ad format is in position to set the bar for ad "interactiveness." As a user hovers over certain items within the image, prices and product names will appear! The other ad format, "Showcase Shopping ads" already exists, just not on the Image SERP. Google has announced that the format will be heading to the top of the image results via a carousel of cards with each card representing a different brand. Upon clicking a card, users will be able to peruse through a set of products related to the brand. Lastly, and towards the end of the month, Google was seen testing a new ability sure to make news publishers happy: slidable articles. With the test, when a user enlarged an image from the Image SERP results that corresponded to a news article, Google tested placing a slidable tab for the article below the image. Users could then simply slide the tab up to access the article. Meaning, the test saw images that were part of a news article get a tab placed at the bottom of the enlarged image. If a user wanted to see the full article that corresponded to the image, all they had to do was slide their finger up! Pretty nifty. On March 21st our SERP Feature Tracker caught a substantial Featured Snippet increase in the UK and many European markets (Canada as well). The increase in Featured Snippets was heavier on mobile with the UK seeing a display level increase of 31%! Not all markets in Europe saw an increase in Featured Snippets. Sweden, for example, did not see the SERP feature increase on either desktop or mobile while Spain saw a marginal increase on desktop and none on mobile. More opportunities for product placement on the SERP, Featured Snippets within the Explore Panel, a new ad label test .... Here are the rest of the latest changes, updates, and tests made to the Google SERP in March 2019! A few nice changes for those wishing to showcase products on the SERP. The first gives business owners an opportunity to showcase 10 offers within the Local Panel. The new "Offers" carousel is part of Google Posts and gives businesses a pretty visual way to entice consumers. Also within the Knowledge Panel, when a product carousel appears, users may now have the option of seeing a fuller product list. In such instances, a header that reads "Explore Collections" appears beneath the carousel. All-in-all.... there is a clear focus on making the SERP a more product heavy environment. This, of course, helps build the image that Google is a source of product knowledge and procurement. This, of course, helps Google compete with its main product competitor... Amazon. Expandable Featured Snippets are nothing new. That said, while doing some research I came across expandable tabs within the Explore Panel (which appears to the right of the results but contains some Featured Snippet formatting). Like in other cases, the tabs here reveal a series of Featured Snippets once expanded. It's unknown exactly when Google added this element to the Explore Panel with some within the community saying they appeared back in February. It's always news when Google tests changes to its ad label on the SERP. Now, Google's ad label is already far more "organic" looking now than it was in the past (remember that bright yellow?). However, in this test, Google experimented with a Google Ad label with no background color. In other words, all users saw was the word Ad in black lettering to the left of the ad... no green, yellow, or even purple background. Of course, this makes it far less conspicuous that the ad is an ad and not an organic result. That can be a good thing if you're the one running the ad and perhaps not such a great thing if you're one of the organic results on the page! Two interesting items in regards to the Knowledge Panel. The first involves a new color theme for many mobile Knowledge Panels. The new theme does away with the dark color palette in favor of a lighter color spectrum. Next up is that things seem to be all mixed up when it comes to language within the Knowledge Panel. In more than one instance I found that the language used in the query did not match the language being used within the Knowledge Panel. In one case, I brought up a Knowledge Panel using an English query where I attempted to buy tickets via the panel. Upon doing so I was taken to the Reserve with Google element within Google Maps... upon which I was shown Spanish in place of English (see below). Google's Danny Sullivan did say he would report the issue to the Google team but as of the writing of this post, the problem seems to persist. Do you remember all of those deep hotel insights that came to the desktop SERP in October 2018? One of the new features was that you could engage with a hotel Knowledge Panel on desktop, click on one of the insights, and be dragged away to a separate Google-owned hotel booking page. As of March you no longer need to use a business panel to access that page. Google has made it possible to simply punch https://www.google.com/travel/hotels into the browser in order to access it's deep booking abilities. Also, Google has added vacation rentals to hotel results on mobile. The rentals are accessed via the 'More Filters" button within either the Local Pack or Local Finder. According to Google, the option to see vacation rentals is headed to desktop in the near future. Google has experimented with showing vacation rentals within hotel listings in the past, but never in any permanent sort of way. Is the 'Q&A on Google' Feature About to Spread Its Wings? In March, Google gave the Q&A on Google feature a more formal look. The feature now appears as a carousel of questions previously submitted by other users with each card offering you the chance to provide an answer. At the same time, you can submit your own questions that I would only assume end up in carousels for other users to answer. At the moment, the Q&A on Google feature is not widespread and I am not even sure if it has ever appeared within the US. That said, the upgraded look says that Google seems to want to go with it and could undergo increased testing. My gut says this is coming to a SERP near you in the relatively near future. Doesn't it feel like when Google makes one major change an abundance of changes comes along with it? I know Google has said that it piggybacks other changes onto algorithm updates, but that's not really what I'm referring to here. For the last few months, I've been almost shocked by Google's lack of blockbuster updates and significant data changes and then just like that we have the March 2019 Core Update, huge gains for mobile Image Thumbnails, a nice decrease in Image Boxes, and a multi-market spike in Featured Snippets! Go figure! Well, that will do it for the April edition of the SERP News! Thanks for reading and we'll catch up on the SERP again in a month from now!